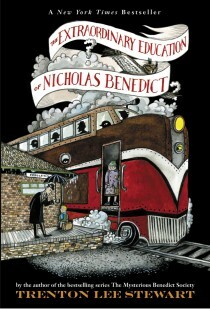 My daughter and I have attempted to read The Extraordinary Education of Nicholas Benedict (book 4, the prequel of The Mysterious Benedict Society bestselling series) several times- we’ve read the beginning three times! And yet we have only reached page 72 between reading together and separately- she got several chapters further than I did. So I asked my nine-year-old what was it about this story that we couldn’t stick with it. Her immediate answer was that there were no animals in it. Almost all the books my nine-year-old reads these days is about animals. So it’s no surprise that she set this book down as soon as she got a Warrior Cats book, a rescued animal book, or a dragon book in at the library. Initially, I thought it was because the gender of the main character, but that’s not the issue because she loves the Harry Potter series. Definitely a different type of book though. I think the initial pacing of this book is a lot slower than keeps our attention these days, but I have to give my daughter kudos for getting to chapter five and I bet she will continue reading it in between her fantasy books (her current favorite genre). I can’t promise that she or I will finish it this year but that is less about the writing than it is about the preferred style (sorry, Mr. Stewart!). I am betting as the action and pace pick up, the story will be harder to set down. It might also help if we started with the first book in the series, The Mysterious Benedict Society, since that would give us a feel for the series and it is more interactive. The writing itself is very descriptive with a humorous quality and the reading level is about 6th grade, pretty close to what my daughter reads. There were a handful of words that were outside her normal vocabulary, but it passed the five-finger rule (put up a finger for each word you don’t know on the page and if you exceed five then the book is too difficult for you). If we can get further into the story, the mystery element should be intriguing. Each chapter heading is a cute black and white illustration by Diana Sudyka. Unfortunately, both my daughter and I found this book did not compete when we had more exciting books from our favorite genres in the house. DNF; I received a free copy in exchange for an honest review.